This summery ice cream based dessert may seem more appropriate for August than September. 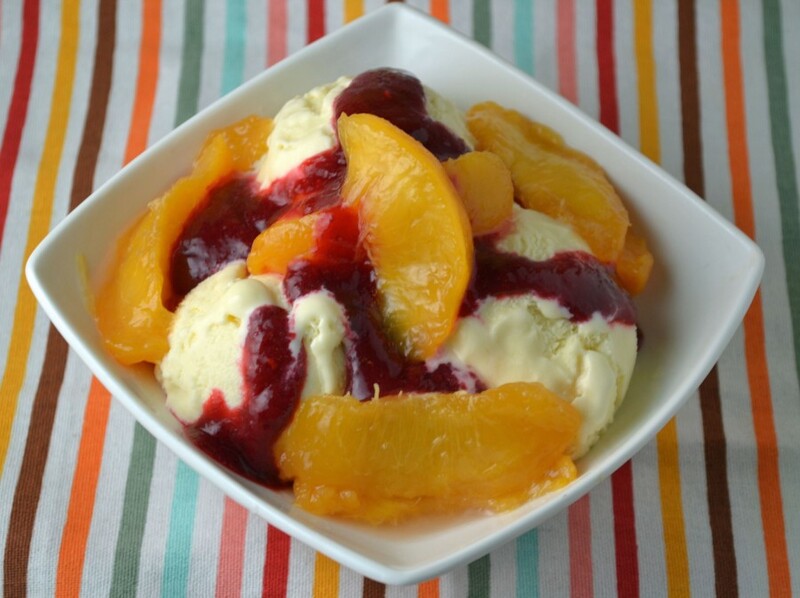 Classic Peach Melba uses summery peaches and raspberries, normally in season in late July and early August. However, most produce has been late this year and surprisingly so has the weather. So far, September in NYC has been hotter than August. It may change soon but in the meantime, sweet juicy peaches from the farmers market are perfect for this cool timeless dessert. Some of you may not be familiar with Peach Melba. Besides the name, there is nothing particularly unique about this old fashioned dessert. In its most basic form, it simply consists of vanilla ice cream with peaches and raspberry sauce. It is somewhat historic though – legend says it was developed by the French chef Escoffier in the late 1800’s and named after Opera singer, Nellie Melba. This recipe is adapted from the James Beard version in “The James Beard Cookbook.” It continues to surprise me how this one time dear friend and mentor of my grandmother, is becoming more and more of a famous culinary figure. There is currently a movie in the works about him (“America’s First Foodie”) as well as postage stamps (yes, James Beard Postage Stamps). The main difference in this recipe from the James Beard one is the use of fresh raspberries for the raspberry sauce. I would imagine this is somewhat closer to the original that Escoffier made (I doubt frozen raspberries were common then but who knows). I also used homemade vanilla ice cream instead of store bought – a rich recipe based on classic crème anglaise. The sweet fresh fruit and rich eggy homemade ice cream makes the flavor of each element stand out on its own. Enjoy this summery dessert while the warm weather lasts. Blanch peaches to peel by slicing an X in the skin at the bottom of peaches. Boil 2-3 minutes until skin starts to peel back slightly on peaches. Remove and place immediately in ice water. Once chilled, peel and slice peaches. Combine the sugar, water, and vanilla in a small saucepan. Bring to a boil and cook 5 minutes. Add peaches and poach gently, spooning hot liquid over them. When tender but not mushy, remove from heat and allow to cool in syrup. While peaches cool, make raspberry sauce. Puree raspberries with a little water. Push through sieve to remove seeds. Whisk in lemon juice and powdered sugar. Chill. Scoop vanilla ice cream into cold dishes. Spoon poached peaches and raspberry sauce over ice cream. Serve immediately. In a medium saucepan, bring heavy cream, milk, and vanilla to a boil over medium low heat – be careful not to let it boil over. Meanwhile beat egg yolks with sugar until pale. Slowly whisk hot milk cream mixture into egg yolks. Pour back into saucepan. Place over low heat. Stir constantly until mixture thickens and coats the back of a spoon. Be careful not to overheat – eggs will curdle. Strain mixture and chill. Churn in ice cream maker according to manufacturer instructions.